I miss this space but life is so busy right now. How are you peeps? I was reading a famous blogger's post including the comments section. This blogger talked about her breastfeeding journey from Baby 1 till no 2. She was comparing both experiences where with no 1 it was breezy but no 2 she stopped early due to personal problems (which she mentioned in the post). There's one visitor who left a comment talking about the benefits of mommy's milk et cetera et cetera which I believe the blogger already knew coz she did well with Baby 1. I think this visitor is rude to comment like that the fact that it was clearly mentioned the blogger had stopped the process months ago. What's your point actually? Whatever parenting style you choose has nothing to do with other parents. Why do you have to snoop around everyone's life and shove all your parenting philosophy down their throat? These kinds of parents used to make my life so miserable at one point I hate myself for not able to achieve the standard of this holy parenting. I wasn't able to breastfeed my baby which I admit due to my lack of experience as a young mother who was struggling with c-sec pain and a husband across the sea with a new baby who didn't know how to latch. I was so confused and tired. Thank God my depression level was Under control or post partum depression could be the end. I struggled for a year pumping milk every two to three hours, cried almost everyday, I was in paiin and I was angry all the time. Ask my husband he knows.hahahahaahah one day I stopped. I unfollow many parents liddis on Facebook, blogs and left most motherhood groups. I keep a few and only share with the people around me whom I know won't judge. These people have different parenting style than me but never once I felt less worthy of being a parent. Wait...this isn't the point. Apology.hahah my point is... Be respectful can you? Cheer each other because we are mothers. We want the best for our kids. I want the best for my kids. Examples la based on my own experience having to face these kind of 'outstanding' parents. 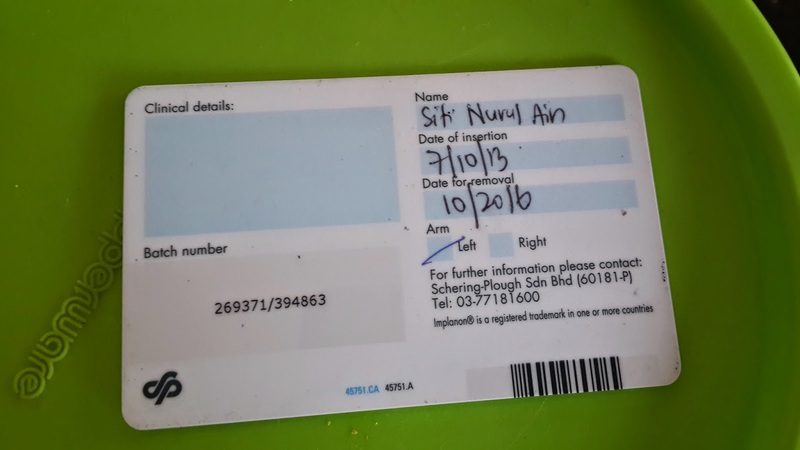 Anak kita kecik lagi, panjang lagi perjalanan jadi jangan riak.Takut ko kecikkan hati orang tuhan bayar cash anak kita yang kena. Paham tak aku membebel ni? Anyhoo, had my D&C or ERPOC yesterday. Basically means my womb has been cleaned. Showed up at the hospital Emergency door sharply at 7am. Admission process was smooth. Already on the ward bed around 7.15. Sakai-ing myself with the new surrounding, well it's a new hospital with very nice view ahahah. I opted for 6 bedded room since it's a simple procedure. Apparently I was the only patient that day so I got that hugeeee room alll for myself. Privacy achieved! Then around 8am, a nurse came to insert 2 pills down my hoo haa. to help to soften the cervix opening bla bla bla. I hate being 'seluk'. Seriously. Anyway, after a few minutes of embarassment being shoved with the pills while being watched by 2 other nurses, it's done. An hour later I started to feel the period pain symptoms. Means the pills worked. At 10am, I was pushed to the preparation area (again pardon the term). waited for almost 40minutes lying on the hard bed and freezing temperature. Period pain you cannot lie down on hard surface. sakit pinggang. I started to feel agitated.tossing on the bed.hahah one nurse noticed and explained to me my doctor would be late as there was an emergency with her other patient. ok la what to do right. Later the anesthetist came to do background checking before he put me to sleep. A funny doctor. He cracked me so I could forget the discomfort for a while. I'm allergic to pain killer. I dunno which type so he asked some more and finally conclude that i might be allergic to aspirin because i kehnot take Panadol activefast. normal Panadol can. Could be aspirin. Then he started explaining about morphin bla bla bla which I couldnt help but replaying the Power Rangers song in my head the whole time till I passed out in the operation theater. Mighty morphin power rangersss!!! Anyway, 10.55AM finally I was brought to OT 1. The room damn cold i started coughing. the temperature ignited my asthma. but not for long. then the anesthetist did his magic and 5 seconds later i heard somebody called my name "Siti....Siti...."
Sent back to the ward where B's waiting. super dizzy and tried to sleep but the nurses kept coming to check BP la, sent food, asked for condition or medication. I was so hungry by then (fasted since midnight) so I asked when can i eat. The nurse said try to drink water first if you dont vomit you can eat. So I drank a glass of water, no sign of puking, quickly gobbled the food. I dont want to spend the night at the ward so I need to get strong again pronto! Story short, my doctor came about 3.30 and I convinced her I'm well enough to go home. She said ok! Honestly, I am super fine. I've had my sad moment losing this one few weeks back when I was first told by doctor that the baby's size is too small for its size. By then I already knew I had lost it so I am fine, really. At the end of April, I dreamed of getting pregnant. In that dream I just found out I was pregnant with another child. Once it happened, when a few days the UPT test showed double lines. Not sure to be ecstatic or what because I totally didn't expect to conceive THAT fast, almost 2 months after I removed implanon and my period cycle was still unstable. A week after that, there was a gush of water coming out from my down under. Went to see a doctor but the doc didn't have the answer. A lot of senior colleagues assured me it was nothing to be worried about. The water came 3times. Clear, odorless liquid. By the 3rd time it happened, I was having a bad cough. And this doctor, with a stern voice told me I should've gone to the hospital. I did go. But the O&G doctor was away. It was Friday. That night I had another dream. I lost the baby. I didn't see the baby but I dreamed of having a miscarriage with the blood and all. Anyhow, the scan was worrying. At least to me. The size didn't match the week I was supposed to be. I was in week 9 where the heartbeats should be easy to detect. There was a small dot, about 1.3cm (week 9 should be around 3cm) and there was nothing inside the circle. I compare the size to Minmin's scan at 9th week. He already showed hands at that age but this baby, nothing. dr Hayati set another appointment the following week to see the progress. Went home, did what most of us like to do, google About our condition, trying to match the symptoms with those found on the Internet and scared the hell out of our lives.hahahahaha don't lie. Googled about blighteD ovum and trying to sink with the reality. Maybe I thought too much about it, I had another miscarriage dream that night. I told B the next day, sort of preparing him mentally about what's coming our way coz based on my google research, there was almost zero hope for blighted ovum. Sooooooo another week passed. Which is today. I started having spotting down under since yesterday (Sunday) and today the bleeding started. Ok it sounds scary and like I'm dying but it's just bleeding and till now I'm just having regular cramps. Nothing serious.
. And the scan shows that the area around the circle has started to bleed. Which means no baby. Dr Hayati sets a DNC (dunno what it stands for but it is to clean the womb so nothing unnecessary remains in there which could lead to serious bleeding and hard to get pregnant bla bla bla. It's a public holiday in Malacca today. Had more free time to waste on Facebook hahahah. Then I found one article about Caesarean Awareness. And apparently, April is the month !!! Reading the article definitely brought back the memories when I had mine. Starting from the moment Dr. Ishaireen told me that I would need the surgery till I got home from the hospital. And also, my eyes somehow swell with tears because I feel so appreciated with the words used. Maybe because, I did hear some moms who could use their own body to pop their baby (vaginal birth) said moms who didn't (csection ) weren't real moms coz we didn't feel the pain bla bla bla bla. I was deeply offended at that time. Hahaha hormonal I guess. Being prepped for a c-section is not a walk through the park. Many times, a mother’s partner is not allowed in the OR until after the epidural has been administered and everyone has “taken their place.” This means that while doctors and nurses move about, readying the operating room for delivery (maybe talking about their lunch or what movie they saw over the weekend) a strong pregnant mama sits on a cold operating table considering what lies before her - often scared and often feeling very alone. 20months after the procedure, I still can't do sit-up. I still can't get up from lying down without having to turn to the side first. I still can't do squat with any heavy weight. The area will strain and eventually cause me pain. 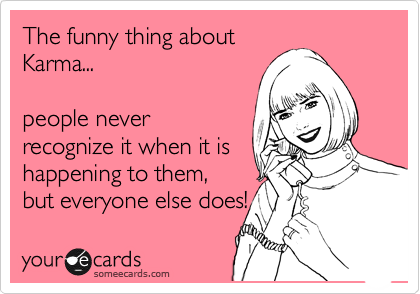 Other than that, I can longer sneeze loudly.hahahahaha well, good for a change right? Think about a woman who is being told she is not permitted to use her own body to give birth. Not because she can't, she is not allowed"
A C-Sec definitely wasn't my birth plan. But the condition didn't permit to have a normal delivery. A friend asked why didn't I try to be induced first. Well, it's my instinct that drove me. Minmin was big, womb fluid was depleting and he hadn't engaged. So I decided on my own after the doc professional advice to go for csection. So, here to all mothers who were brave and strong to endure the procedure going under the knives and be cut open to bring a new life to the world! 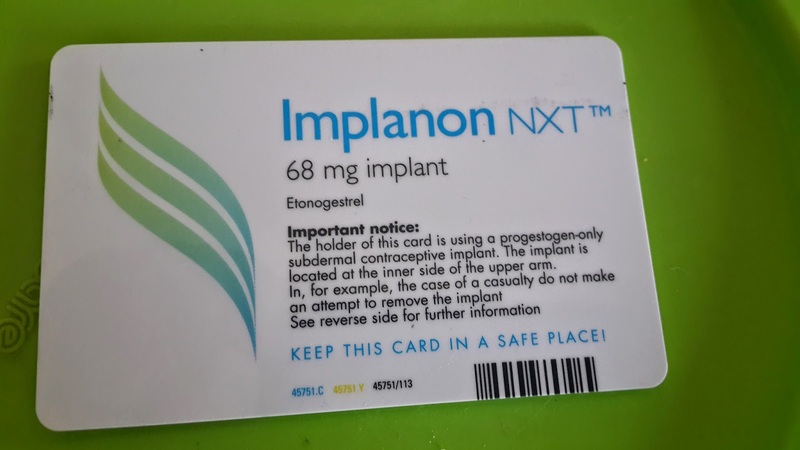 So... after discussion with le hub, I decided to go for Implanon. Why? Less hassle. And one thing, it doesnt disturb milk production, which is the main advantage that drew my attention. I did a little research for the cost, side effects, where to get, how to get basically everything and got the minor surgery (cheh!) a week after confinement ended. 2. Cost: RM320 in 2013. Heard the price has gone up this year. The cheapest I could find. Private clinics charge more. 3. The procedure: Inject anesthetic, then insert that thanggg. The size is as big as a match stick. 4. Expired after 3 years. 5. The side effects: There are many. But am gonna tell the effects that I kena ok.
irregular period. Started coming after Minmin was 8months old (delay could be due to BF). BUTTTTTTTTTTTT the length of the cycle drove me crazy. Each cycle lasted for a couple of months. Every timeeeee! Not heavy flow, more like spotting but still... rimas mak ok! Weight gain. Erm... actually not sure whether this is the side effect but i need something to blame.hahaha I started eating healthy and going to gym but no changes. except lost 1kg. so really guys, i need to blame this implanon. So, due to the first side effect, I decided to remove this susuk last week. I really cannot tahan with the long menses period. So I took it out at a private clinic. If you are from Melaka and intend to remove yours, can go to KLINIK MAIZA, Cheng. Charged only RM40. Less than 5 minutes all's done! But of course, need to make appointment first ok. So, that's my honest testimonial about implanon. Not much but honest. cewah! Hope this post helps you in any way it can. p/s pardon all the grammar error. Not feeling like a teacher tonight. Feeling like me. This by far the longest time I feel relax since forever.haha Alhamdulillah for this blessing. I can just pray for this good feeling to continue. Be positive everyone!! This is one fundamental concept I learn this new year. There was so much fuss on my Fb timeline about this expose vs expose in Singapore. Not gonna talk about the expose but I was curios why there are so much hatred against this lady. So I did a little research. Well, useless coz it doesnt concern me but hey,I was curious. Anyhoo, that's karma, or whatever concept you believe. Things you do today might turn back at you, to hurt you or worse your loved ones. Unless it's a good one. Since I become a mother, I am really scared anything bad or harmful happen to Minmin. Nauzubillah...I hope he will always be under the blessing around the people who love him. So, let's be a better person today. Whenever you feel like bashing someone on social media like FB, twitter, blog, stop and reflect. We are not perfect. They arent too. Be nice. One day it could be our turn. This is so true. We could realize it, but so much later after endless of reflections. Be nice. A strict reminder, to myself!